St Peter’s CE Primary School in Newport has become an IQM Flagship School. St Peter’s Primary School is a smaller than average, consistently oversubscribed school with 212 pupils on roll, serving a largely rural area in Edgmond a village near Newport, Shropshire. All markers of deprivation are well below the national average. Almost all pupils are White British. The proportion of pupils with a special educational need is below the national average. The school is very open and welcoming in a superbly well-resourced building, with superb grounds with numerous seating and eating areas that are well shaded, including fantastic outdoor learning areas such as The Willow House, a Forest School Style area and Holly Bush trail and extensive playing areas including two large grass fields, and a tarmac football cage, that are regularly used for outdoor learning opportunities. During the review I was able to see this in action with two classes actively working outside as part of maths learning. A year 5 class was working independently on the field to determine the height of a tree, and its age by its girth. It was a pleasure to see the whole class actively and enthusiastically engaged in practical learning, something the school is keen to develop further. This is a school where every child really does matter and is made to feel special. The school and staff are committed to providing the very highest standard of teaching and learning experiences which not only develop the pupils’ knowledge and skills but also gives them the opportunities to excel in all areas of the curriculum and other learning opportunities. The school ethos ensures that every pupil is treated with respect and all staff actively model how they expect the pupils to behave. Their aim is to build confident, resilient pupils with a love of life and learning. They manage this superbly, a fact that I can attest to from the evidence of the rigorous review. Everyone involved with the school including pupils and parents pull together to realise the school’s vision which is that the school is a superbly inclusive place to come to work and learn. This is a school that is clearly at the heart of its community where inclusion is a natural part of what normally happens in school, where pupils are encouraged to achieve their full potential, where everyone involved is committed to the inclusion of all pupils whatever it takes. A school that is constantly looking at ways to develop for the benefit of the pupils and families that it serves. This is a school where all pupils are clearly valued as individuals and this is encapsulated in everything that happens and was clearly seen on a tour of the school and through interactions during the review with staff and pupils, in classes, and on a learning walk in all classes. This is a school that is at the heart of its community where inclusion is ingrained in the very fabric of the school and superb care, nurture and support naturally occurs here. It is a superbly impressive, inclusive learning environment in a fantastic building, where everyone involved is committed to the inclusion of all staff, parents and pupils. I was again, as I was during my first visit, impressed by the confident and happy pupils and by the shared vision of the staff in the school, who are totally committed to inclusion in its broadest and best sense. There is a calm, happy, stimulating, vibrant learning environment throughout the school with a focus on helping pupils to develop the skills, they need to be effective and are encouraged to become independent learners. Everyone I met was helpful and spoke very positively about their experiences at the school. with a tight focus on improving the attainment and wider outcomes for all pupils and not just promoting the learning of the lowest or highest achievers as with the previous review it is clear to see that the school`s actions to care for pupils, in my judgement, is superb. During the review, I saw the school at work and experienced the truly inclusive ethos and culture that is embedded in everything the school does, for the benefit of every pupil. They are valued for who they are and what they will become, no matter their starting point. The staff are exceptionally positive about the school and continually go the extra mile and beyond to ensure that the pupils’ needs are met. There is a superb quality of support, care and nurture within the school that enhances the provision at the school, that includes the Governing Body. In discussion with a newly appointed Foundation Governor, her enthusiasm and passion for supporting the school and pupils shone through and she commits time willingly to support the pupils coming in twice a week to hear pupils read, a fantastic commitment and one that is reflected across the Governing Body, I believe. All staff I spoke to in meetings or around the school were highly positive about the school. They are clearly very enthusiastic, highly motivated, professional and justifiably proud of what they achieve both professionally and in terms of support for the pupils and themselves. They work exceptionally hard to ensure that the needs of pupils are met and there is mutual respect and care that is evident across the staff body. 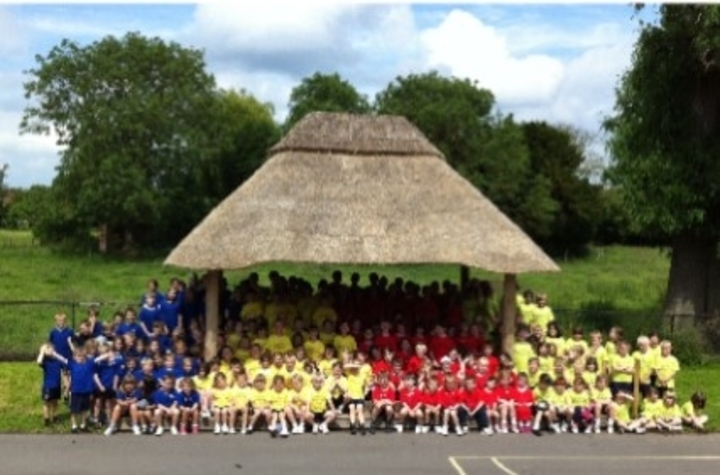 There is a fantastic rapport between the staff, the pupils in the school and between the staff at all levels. An example of the support offered to staff includes two Teaching Partners I spoke to who work very closely with teachers to ensure that the needs of all pupils are met. During a meeting they were keen to talk to me about how positive the school was and that they felt valued and a part of a team with teachers supporting each other. One of these individuals had been supported in changing career from professional sport and coaching to become a teaching partner and the other one was in the process of working towards a degree and a dream of becoming a teacher fully supported by the school. This is a clear indication of the superb inclusivity of the school that encompasses every person involved here. All staff have a clear vision for the school and their pupils and a relentless determination and drive for all pupils to succeed. This came across very clearly in meetings and discussions with staff at all levels and with the pupils I met and talked to and is a very real strength of this outstanding and highly inclusive school. Pupils have a clear enjoyment of learning about themselves and the world around them. This is apparent as soon as you step into the school and is highly visible in classrooms around the school and at social times as well. It is a real strength of the school and the staff should be commended for ensuring the pupils have this attitude to learning instilled in them. The school provides a superb welcoming, safe, happy, environment where everyone is respected and listened to. A school where everyone takes pride in themselves and their achievements, where pupils are enabled to develop responsibility and become confident and successful learners, while also striving to be at the heart of the local community, an integral part of society, part of a wider community. The school and its staff work exceptionally hard at being a partner in the education of the school’s families and are totally committed to working in partnership with those parents and the wider community. The behaviour and safety of pupils from the evidence of this review is exemplary. The pupils, their parents and the school should be immensely proud of the way the pupils conduct themselves around the school. I spoke to groups of pupils during the review in classrooms as part of a tour round the building with two Year 6 pupils and during a learning walk, and in more formal discussions with members of the School Council and they showed a maturity beyond their years and were very articulate. They are responsible and mature learners who value their education and take a full and active role in school life and have decision making authority in their own classrooms as well as across school. They undertake pastoral responsibilities; they have a very strong voice, through the School Council and in their daily interactions with staff. They take an active role in organising events throughout the school year. Parents are well informed of their children’s progress and what they can do to support the school and their child’s development. This partnership is a very clear key strength of the school, parents and governors are actively involved in shaping and developing the vision of the school and communicating extremely effectively through its website, letters, texts and social media. Continuous improvement in all areas of the school is key to the school’s success and their superb inclusive practice, demonstrated by the refurbishment of the foundation stage learning areas. This will enable the newly appointed EYFS lead to improve things even further from September and, working with her staff, link even more effectively with the onsite Owls Nursery. This may be complemented by the possibility of using Tapestry, an online Learning Journal for EYFS, that has now been developed to include Year 1 – 6 and from which the school and parents may well benefit. This is further demonstrated by their willingness to be involved in innovation and piloting such innovations such as Calm Brain working alongside a clinical Psychologist to develop the programme. Everyone involved in the school works hard to ensure this happens and this is set alongside rigorous yet supportive accountability processes and tracking and monitoring of pupils. Well planned and continuous professional development underpins this work. The school makes every effort to use appropriate internal and external professional partners and agencies either through the local authority or by buying in expertise to suit the needs of school at key points. This will ensure that the inclusive ethos and atmosphere of the school is of the highest order, such as The Early Intervention Worker who works in the school and is employed by the Newport Cluster of schools, working across the nine Primary settings and one Secondary for the benefit of pupils and families. The Intervention Worker will be working on a flexible basis, supporting pupils and families on such needs as anxiety issues, emotional well-being and resilience building; using an Emotional Well-Being toolkit for families – ‘Building Resilience and Reducing Anxiety’ that is a superb resource, and who works alongside a Clinical Psychologist bought in by the cluster to further improve the support that can be offered. All staff spoken to during the review were extremely enthusiastic, highly motivated and proactive in their efforts to improve what is offered to the pupils. There is an excellent culture of critical reflection that permeates the school meaning that existing strategies, programmes and schemes are robustly evaluated and refined where appropriate. Additionally, the school continues to seek new solutions to the challenges that are faced in achieving the goal of enabling all pupils to succeed to the best of their abilities. Having completed a rigorous and thorough review and having discussed and agreed the targets cited in the report and their involvement in and capacity to support and attend Cluster Group meetings and understanding that their involvement will form a significant part of their next annual Review, I am of the opinion that St Peter’s Church of England Controlled Primary School remains a school with the Inclusion agenda at the forefront of everything it provides for its pupils. The environment is superb providing an excellent teaching and learning environment for teachers, support staff, pupils and the local community. They have proved their expertise over the years of IQM accreditation and I believe they have the drive and capacity to be a Flagship School. I recommend, without reservation, that the school be given the accreditation, and moves from Centre of Excellence status to hold Flagship status.